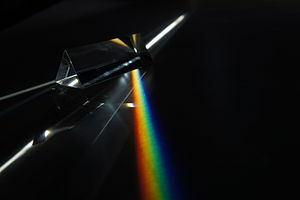 Dispersion of light (photons) by a prism. Photonics is the physical science of light (photon) generation, detection, and manipulation through emission, transmission, modulation, signal processing, switching, amplification, and sensing. Though covering all light's technical applications over the whole spectrum, most photonic applications are in the range of visible and near-infrared light. The term photonics developed as an outgrowth of the first practical semiconductor light emitters invented in the early 1960s and optical fibers developed in the 1970s. The word 'photonics' is derived from the Greek word "phos" meaning light (which has genitive case "photos" and in compound words the root "photo-" is used); it appeared in the late 1960s to describe a research field whose goal was to use light to perform functions that traditionally fell within the typical domain of electronics, such as telecommunications, information processing, etc. Photonics as a field began with the invention of the laser in 1960. Other developments followed: the laser diode in the 1970s, optical fibers for transmitting information, and the erbium-doped fiber amplifier. These inventions formed the basis for the telecommunications revolution of the late 20th century and provided the infrastructure for the Internet. Though coined earlier, the term photonics came into common use in the 1980s as fiber-optic data transmission was adopted by telecommunications network operators. At that time, the term was used widely at Bell Laboratories. Its use was confirmed when the IEEE Lasers and Electro-Optics Society established an archival journal named Photonics Technology Letters at the end of the 1980s. During the period leading up to the dot-com crash circa 2001, photonics as a field focused largely on optical telecommunications. However, photonics covers a huge range of science and technology applications, including laser manufacturing, biological and chemical sensing, medical diagnostics and therapy, display technology, and optical computing. Further growth of photonics is likely if current silicon photonics developments are successful. Photonics is closely related to optics. Classical optics long preceded the discovery that light is quantized, when Albert Einstein famously explained the photoelectric effect in 1905. Optics tools include the refracting lens, the reflecting mirror, and various optical components and instruments developed throughout the 15th to 19th centuries. Key tenets of classical optics, such as Huygens Principle, developed in the 17th century, Maxwell's Equations and the wave equations, developed in the 19th, do not depend on quantum properties of light. Photonics is related to quantum optics, optomechanics, electro-optics, optoelectronics and quantum electronics. However, each area has slightly different connotations by scientific and government communities and in the marketplace. Quantum optics often connotes fundamental research, whereas photonics is used to connote applied research and development. The term optoelectronics connotes devices or circuits that comprise both electrical and optical functions, i.e., a thin-film semiconductor device. The term electro-optics came into earlier use and specifically encompasses nonlinear electrical-optical interactions applied, e.g., as bulk crystal modulators such as the Pockels cell, but also includes advanced imaging sensors. Optoacoustics or photoacoustic imaging where laser energy delivered into biological tissues will be absorbed and converted into heat, leading to ultrasonic emission. Polaritonics, which differs from photonics in that the fundamental information carrier is a polariton. Polaritons are a mixture of photons and phonons, and operate in the range of frequencies from 300 gigahertz to approximately 10 terahertz. Applications of photonics are ubiquitous. Included are all areas from everyday life to the most advanced science, e.g. light detection, telecommunications, information processing, photonic computing, lighting, metrology, spectroscopy, holography, medicine (surgery, vision correction, endoscopy, health monitoring), biophotonics, military technology, laser material processing, art diagnostics (involving InfraRed Reflectography, Xrays, UltraViolet fluorescence, XRF), agriculture, and robotics. Just as applications of electronics have expanded dramatically since the first transistor was invented in 1948, the unique applications of photonics continue to emerge. Economically important applications for semiconductor photonic devices include optical data recording, fiber optic telecommunications, laser printing (based on xerography), displays, and optical pumping of high-power lasers. The potential applications of photonics are virtually unlimited and include chemical synthesis, medical diagnostics, on-chip data communication, laser defense, and fusion energy, to name several interesting additional examples. Microphotonics and nanophotonics usually includes photonic crystals and solid state devices. The science of photonics includes investigation of the emission, transmission, amplification, detection, and modulation of light. Light sources used in photonics are usually far more sophisticated than light bulbs. Photonics commonly uses semiconductor light sources like light-emitting diodes (LEDs), superluminescent diodes, and lasers. Other light sources include single photon sources, fluorescent lamps, cathode ray tubes (CRTs), and plasma screens. Note that while CRTs, plasma screens, and organic light-emitting diode displays generate their own light, liquid crystal displays (LCDs) like TFT screens require a backlight of either cold cathode fluorescent lamps or, more often today, LEDs. Characteristic for research on semiconductor light sources is the frequent use of III-V semiconductors instead of the classical semiconductors like silicon and germanium. This is due to the special properties of III-V semiconductors that allow for the implementation of light emitting devices. Examples for material systems used are gallium arsenide (GaAs) and aluminium gallium arsenide (AlGaAs) or other compound semiconductors. They are also used in conjunction with silicon to produce hybrid silicon lasers. Light can be transmitted through any transparent medium. Glass fiber or plastic optical fiber can be used to guide the light along a desired path. In optical communications optical fibers allow for transmission distances of more than 100 km without amplification depending on the bit rate and modulation format used for transmission. A very advanced research topic within photonics is the investigation and fabrication of special structures and "materials" with engineered optical properties. These include photonic crystals, photonic crystal fibers and metamaterials. Optical amplifiers are used to amplify an optical signal. Optical amplifiers used in optical communications are erbium-doped fiber amplifiers, semiconductor optical amplifiers, Raman amplifiers and optical parametric amplifiers. A very advanced research topic on optical amplifiers is the research on quantum dot semiconductor optical amplifiers. Photodetectors detect light. Photodetectors range from very fast photodiodes for communications applications over medium speed charge coupled devices (CCDs) for digital cameras to very slow solar cells that are used for energy harvesting from sunlight. There are also many other photodetectors based on thermal, chemical, quantum, photoelectric and other effects. Modulation of a light source is used to encode information on a light source. Modulation can be achieved by the light source directly. One of the simplest examples is to use a flashlight to send Morse code. Another method is to take the light from a light source and modulate it in an external optical modulator. An additional topic covered by modulation research is the modulation format. On-off keying has been the commonly used modulation format in optical communications. In the last years more advanced modulation formats like phase-shift keying or even orthogonal frequency-division multiplexing have been investigated to counteract effects like dispersion that degrade the quality of the transmitted signal. Photonics also includes research on photonic systems. This term is often used for optical communication systems. This area of research focuses on the implementation of photonic systems like high speed photonic networks. This also includes research on optical regenerators, which improve optical signal quality. Photonic integrated circuits (PICs) are optically active integrated semiconductor photonic devices which consist of at least two different functional blocks, (gain region and a grating based mirror in a laser...). These devices are responsible for commercial successes of optical communications and the ability to increase the available bandwidth without significant cost increases to the end user, through improved performance and cost reduction that they provide. The most widely deployed PICs are based on Indium phosphide material system. Silicon photonics is an active area of research. Data Centers: Today, Facebook, Amazon, Apple and Google alone run massive cloud computing data centers. As companies and institutions store and process more information in the cloud, the demands on wired and wireless networks multiply. In 2013, the US National Resources Defense Council calculated that data centers consumed the equivalent of 34 large (500-Megawatt) coal-fired power plants, or enough energy to power New York City for two years. In another seven years, the amount of data traffic is predicted to double. Using integrated photonics technologies, the centers will be able to handle greater Terabit-scale data rates of traffic with nanosecond switching speeds, while consuming only half as much power, resulting in a dramatic cost savings. Sensors: Photons can also be used to detect and differentiate the optical properties of materials. They can identify chemical or biochemical gases from air pollution, organic produce, and contaminants in the water. They can also be used to detect abnormalities in the blood, such as low glucose levels, and measure biometrics such as the pulse. Photonic integrated circuits are being designed as comprehensive and ubiquitous sensors with glass/silicon, and embedded via high-volume production in various mobile devices. Mobile platform sensors are enabling us to more directly engage with practices that better protect the environment, monitor food supply and keep us healthy. LIDAR and other Phased Array Imaging: Arrays of PICs can take advantage of phase delays in the light reflected from objects with three-dimensional shapes to reconstruct 3D images, and Light Imaging, Detection and Ranging (LIDAR) with laser light can offer a complement to radar by providing precision imaging (with 3D information) at close distances. This new form of machine vision is having an immediate application in driverless cars to reduce collisions, and in biomedical imaging. Phased arrays can also be used for free-space communications and novel display technologies. Current versions of LIDAR predominantly rely on moving parts, making them large, slow, low resolution, costly, and prone to mechanical vibration and premature failure. Integrated photonics can realize LIDAR within a footprint the size of a postage stamp, scan without moving parts, and be produced in high volume at low cost. ^ Chai Yeh (2 December 2012). Applied Photonics. Elsevier. pp. 1–. ISBN 978-0-08-049926-0. ^ Richard S. Quimby (14 April 2006). Photonics and Lasers: An Introduction. John Wiley & Sons. ISBN 978-0-471-79158-4. ^ "Sea mouse promises bright future". BBC News. 2001-01-03. Retrieved 2013-05-05. ^ Hervé Rigneault; Jean-Michel Lourtioz; Claude Delalande; Ariel Levenson (5 January 2010). Nanophotonics. John Wiley & Sons. pp. 5–. ISBN 978-0-470-39459-5. ^ Al-Tarawni, Musab A. M. (October 2017). "Improvement of integrated electric field sensor based on hybrid segmented slot waveguide". Optical Engineering. 56: 107105. Bibcode:2017OptEn..56j7105A. doi:10.1117/1.oe.56.10.107105.